Ryanair was perhaps one of the most talked about European airlines over last year, perhaps even more than the bankruptcies of Monarch and Air Berlin. After all, Ryanair was the airline that publically rowed with its staff, suffered strikes and walkouts, had to delay the arrival of some of its new aircraft and of course ruined the travel plans of hundreds of thousands of passengers when they cancelled a whole series of flights due to the pure incompetence of its rostering managers. Yet even with that negative publicity, that ill feeling among staff, that continual search to rake even more cash from passengers in underhand fees and service charges, the airline, one of the biggest in Europe has still posted a massive profit! 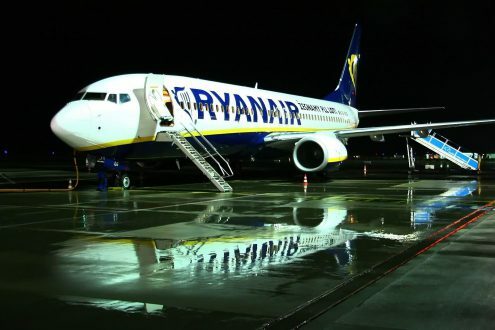 Ryanair said profit after tax rose 10 percent to a record 1.45 billion euros ($1.70 billion) in the year ended 31st March, as passenger numbers increased 9 percent despite the grounding of 25 of its 400 aircraft from November mainly due to crew rota issues. The airline advised that its load factor - bums on seats - was at 95 percent average for the year, one of the highest in the 'low-cost' airline industry, which was thanks in part to the re-accommodation of some of the passengers that had been due to fly on the 20,000 flights the company cancelled in the autumn. With more strikes on the horizon and the unionisation of the company, next year's profit is, the airline warns, not expected to be as much. They say annual profits will fall for the first time in five years due to higher fuel and staffing costs and on the flat fares across Europe's low-cost travel market.